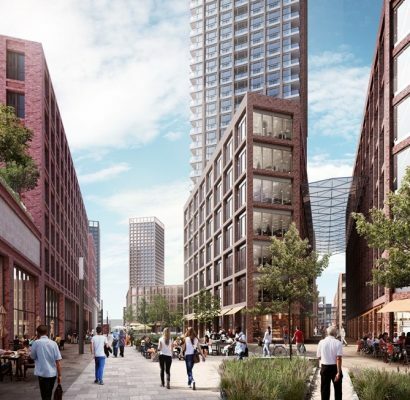 The Masterplan by Allies and Morrison for the £4 billion 21.2 ha regeneration of Canada Water – a scheme that developer British Land is calling the largest single-owned development in London – has been submitted for planning permission. The proposal comprises up to 3,000 homes, 40 new buildings, three clusters of high-rise towers and a new town centre. 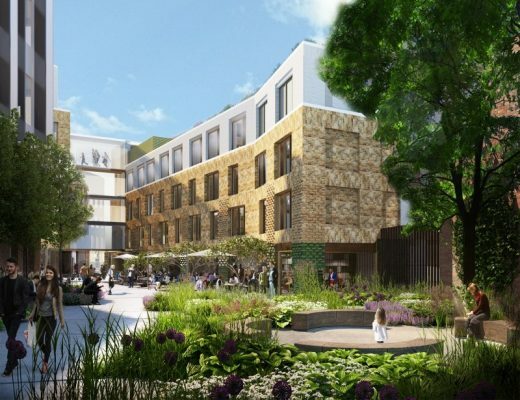 Allies and Morrison will also design two mixed-use buildings and Duggan Morris Architects will design a housing block. 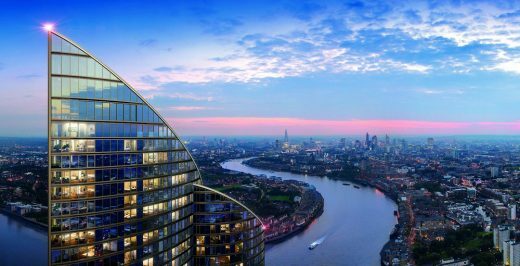 A development agreement between The London Borough of Southwark and property developers British Land, ensures the local authority take a flexible 20% stake in the development. It also commits British Land to deliver 35% affordable housing on the site, with 70% of those at social rents. It will also give the council an option to buy the site’s social-rented homes. 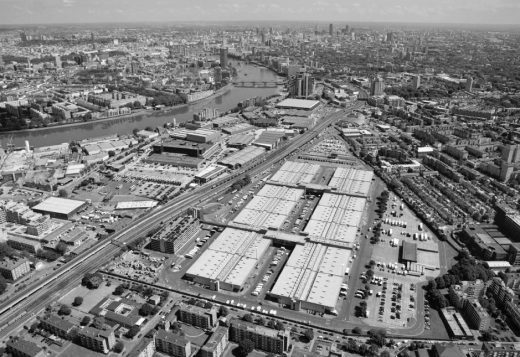 This Canada Water Masterplan by Allies and Morrison is guiding the development of a new urban centre located at the heart of southeast London’s Rotherhithe peninsula, historically a network of working docks and canals connected to the River Thames. 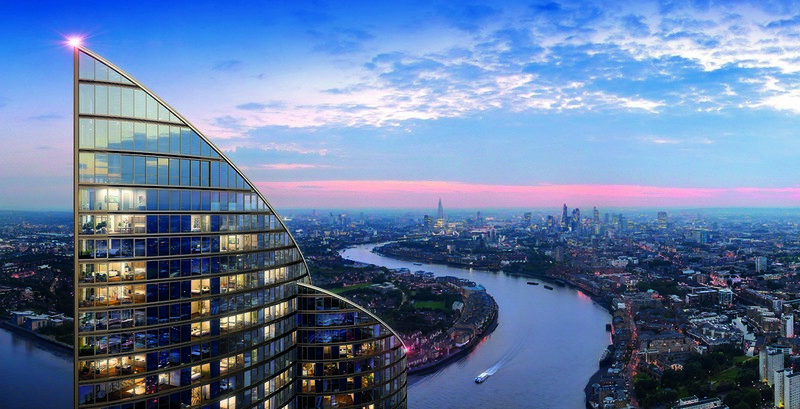 The 21 ha site sits between Canada Water and Surrey Quays stations, with access to both Canada Water and Greenland Docks. 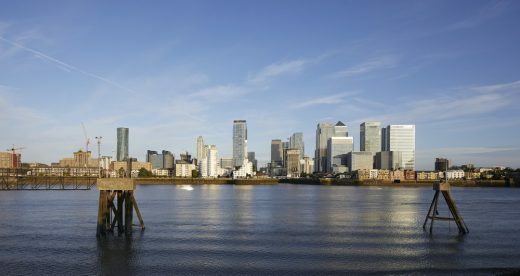 The project has involved extensive community consultation and aims to create a collection of urban and green spaces which makes the most of the site’s dockside setting and transport connections to the rest of London. The masterplan has evolved from a contextual understanding of the site to shape unique and memorable places while being flexible enough to allow yet-to-be-known possibilities. The proposals replace the 1980s big box Surrey Quays Shopping Centre with a legible network of streets, laneways and locally distinct public squares. This urban fabric will enable a rich variety of uses to take root, from offices, shops and cafes to leisure, community and public places as well as new homes for a range of ages, incomes and life stages. The aim is to create a new human-scaled piece of city, diverse and interesting, which is permeable with surrounding neighbourhoods. 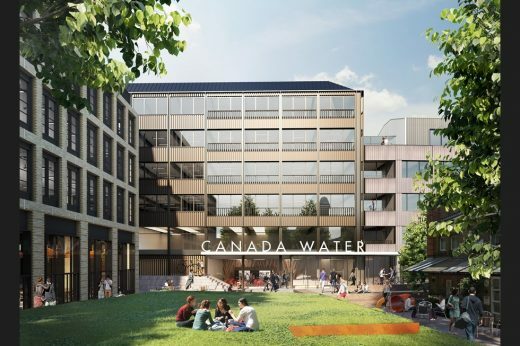 The plan also incorporates the surrounding ecological and waterside qualities into the future identity of Canada Water. 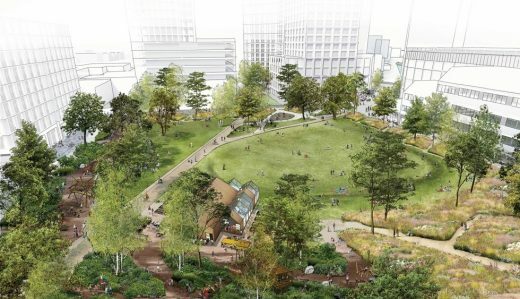 There will be new connections to Southwark Park from the west and Russia Dock Woodland in the east, and beyond to the River, through a series of open spaces, cycle paths and walkable routes. Water will become a definitive amenity and community gardens and play spaces will contribute to the wellbeing of both residents and visitors. Biodiversity corridors will help species to flourish and allow for travel between parks in the wider area. This new landscape network will help to further root a once isolated, low density piece of London into the surrounding urban and natural environments. Townshend Landscape Architects designed the public realm for the masterplan, including the Park and Town Square – approximately 40% of the site area. Townshend has spent the last 4 years working closely as an integral part of the masterplan team to help inform the size the public spaces and streets appropriately, and to integrate into its surroundings, as well as develop a vision, and character for each of the spaces.